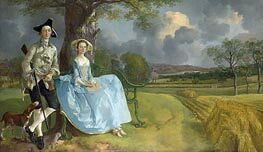 Thomas Gainsborough (May 14, 1727 (baptised) - August 2, 1788) was one of the most famous portrait and landscape painters of 18th century Britain. 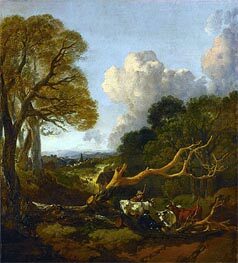 Gainsborough was born in 1727 in Sudbury, Suffolk, England. His father was a schoolteacher involved with the wool trade. At the age of fourteen he impressed his father with his pencilling skills so that he let him go to London to study art in 1740. In London he first trained under engraver Hubert Gravelot but eventually became associated with William Hogarth and his school. One of his mentors was Francis Hayman. 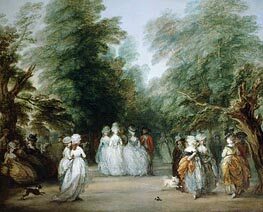 In those years he contributed to the decoration of what is now the Thomas Coram Foundation for Children and the supper boxes at Vauxhall Gardens. 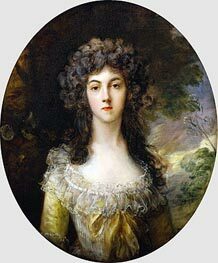 In the 1740s, Gainsborough married Margaret Burr whose illegitimate father, The Duke of Beaufort, gave them a £200 annuity. 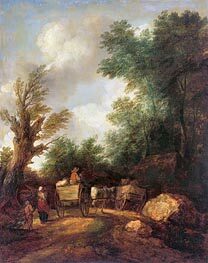 His work, which was mainly composed of landscape paintings, was not selling very well. 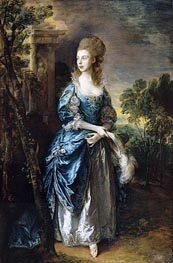 He returned to Sudbury in 1748-1749 and concentrated on the painting of portraits. In 1752, he and family, now including two daughters, moved to Ipswich. 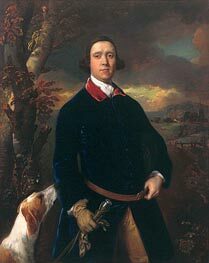 Commissions for personal portraits increased but his clientele included mainly local merchants and squires. He had to borrow against his wife's annuity. 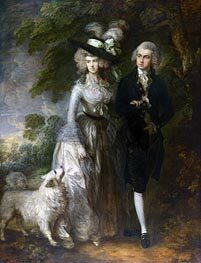 In 1759, Gainsborough and his family moved to Bath. There he studied portraits by van Dyck and was eventually able to attract better-paying high society clientele. 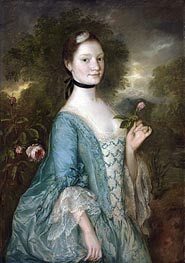 In 1761 he began to send work to the Society of Arts exhibition in London (now the Royal Society of Arts, of which he was one of the earliest members) and from 1769 to the Royal Academy's annual exhibitions. He selected portraits of known or notorious clients to attract attention. 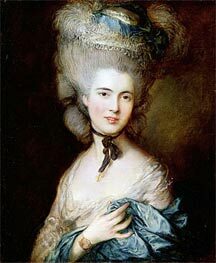 Exhibitions helped him to gain a national reputation and he was invited to become one of the founding members of Royal Academy in 1769. 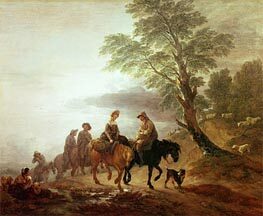 His relationship with the academy, however, was not an easy one and he stopped exhibiting his paintings there in 1773. 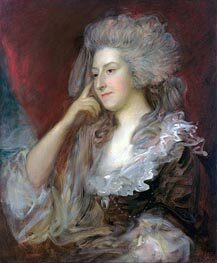 In 1774, Gainsborough and his family moved to London to live in Schomberg House, Pall Mall. 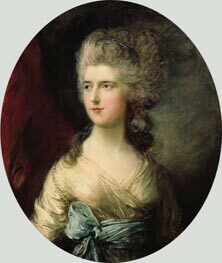 In 1777 he again began to exhibit his paintings in the Royal Academy, with portraits of contemporary celebrities, including the Duke and Duchess of Cumberland, related to the royal family. These exhibitions continued for the next six years. 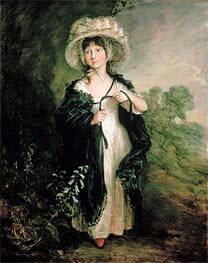 In 1780, he painted the portraits of King George III and his queen and afterwards received many royal commissions. This gave him some influence with the Academy to state in what form he wished his work to be exhibited. 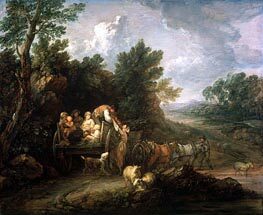 However, in 1783 he took his paintings from the forthcoming exhibition and moved them to Schomberg House. 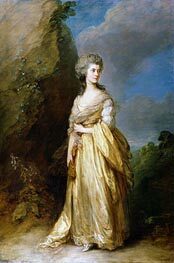 In 1784, royal painter Allan Ramsay died and the King was obliged to give the job to Gainsborough's rival and Academy president, Joshua Reynolds. 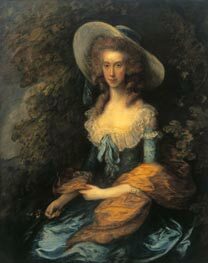 Gainsborough still remained the favourite painter of the Royal Family. 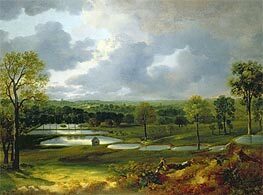 In his later years, he often painted landscapes of common settings. 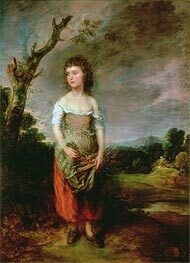 With Richard Wilson, he was one of the originators of the eighteenth-century British landscape school, and with Joshua Reynolds, he was the dominant British portraitist of the second half of the 18th century. 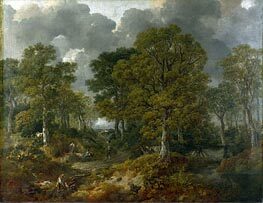 Gainsborough painted more from his observations of nature than from any application of formal rules. 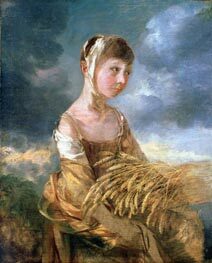 The poetic sensibility of his paintings caused Constable to say, "On looking at them, we find tears in our eyes and know not what brings them." He himself said, "I'm sick of portraits, and wish very much to take my viol-da-gam and walk off to some sweet village, where I can paint landskips (sic) and enjoy the fag end of life in quietness and ease." 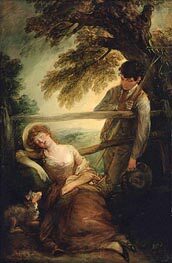 His best works, such as Portrait of Mrs. Graham; Mary and Margaret: The Painter's Daughters; William Hallett and His Wife Elizabeth, nee Stephen, known as The Morning Walk; and Cottage Girl with Dog and Pitcher, display the uniqueness (individuality) of his subjects. 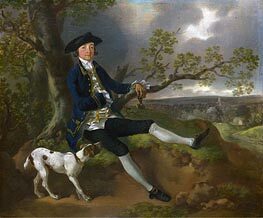 His only assistant was his nephew Gainsborough Dupont. 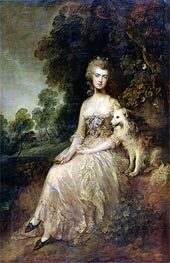 Gainsborough died of cancer on 2 August 1788 in his 62nd year.